My mom was just going to foster me (I’m the one on the right), but with my “licking” coping mechanism, she knew it might be hard for me to be adopted. Since I licked the air and everything else, Mom renamed me “Sugar”. My sibling, also from San Antonio Chapter of Austin Boxer Rescue, and I just hit it off because she really, really wanted someone to play with. So Mom ended up adopting me. I had a pretty hard life growing up in an “Animal Hoarder’s Home”, but Mom picked me up at San Antonio Animal Control facility about 9 mos ago and decided I’d reached my forever home. Needless to say, I’m one happy boxer that Jen Pope and the Board of Directors approved my adoption. I’ve learned to walk on a leash, sit, high-five, use a dog door, play with toys and go to the dog park almost every day. I was able to put on the 8 lbs, my doc said I needed to gain. I’m one happy pup!! My Mom continues to volunteer with ABR in San Antonio and keeps giving our beds away to the dogs we temporarily foster. So she bought me another one when we got up from our nap. I got to pick it out! 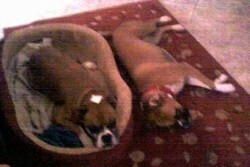 We Boxers need all the help we can get, and in return, we’ll give all the sloppy kisses you can stand. Thank you ABR for all you do!